Office Notebook for Occasional Gaming? Lenovo has built a quiet office notebook on the AMD Trinity platform, which, supposedly, delivers decent gameplay for the latest games. So is the laptop worth its price tag of 479 Euros (~$620)? Where does it stand in terms of performance? The following review will answer those questions in detail. The IdeaPad N586 series is the AMD counterpart to the recently tested IdeaPad N581 series. The IdeaPad N581 line covers about 20 different configurations. 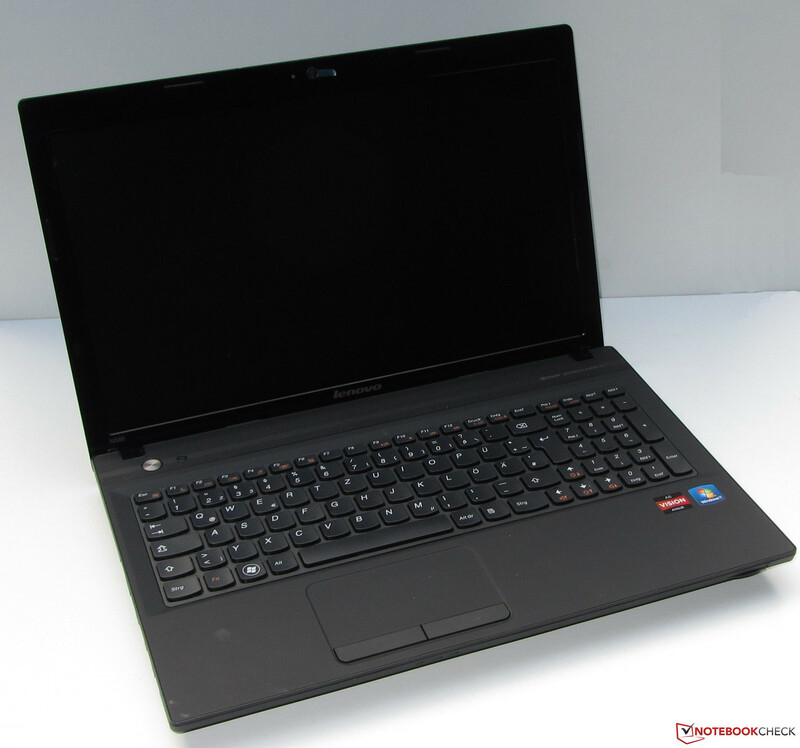 On the other hand, the IdeaPad N586 series consists of a single configuration (that of our test model). 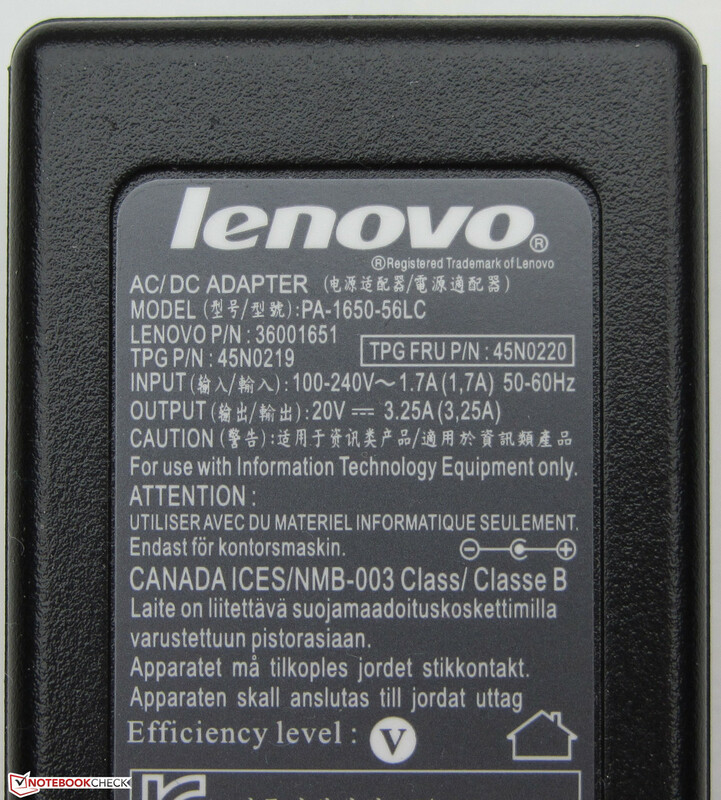 The Lenovo laptop is equipped with an AMD APU (AMD A6-4400M). This APU is a dual-core CPU and is accompanied by an AMD Radeon 7520G IGP. Furthermore, the manufacturer has seen fit to equip the notebook with 8 GB of RAM. The hard disk of the notebook has a capacity of 750 GB and a DVD burner is also installed. We will use the following models for comparison: Lenovo IdeaPad N581 (Intel Pentium B970, Intel HD Graphics (Sandy Bridge)), HP 655 (AMD E2-1800, AMD Radeon HD 7340) and Packard Bell EasyNote TK85-JN-105GE (Intel Core i3-380M, Nvidia GeForce 610M). 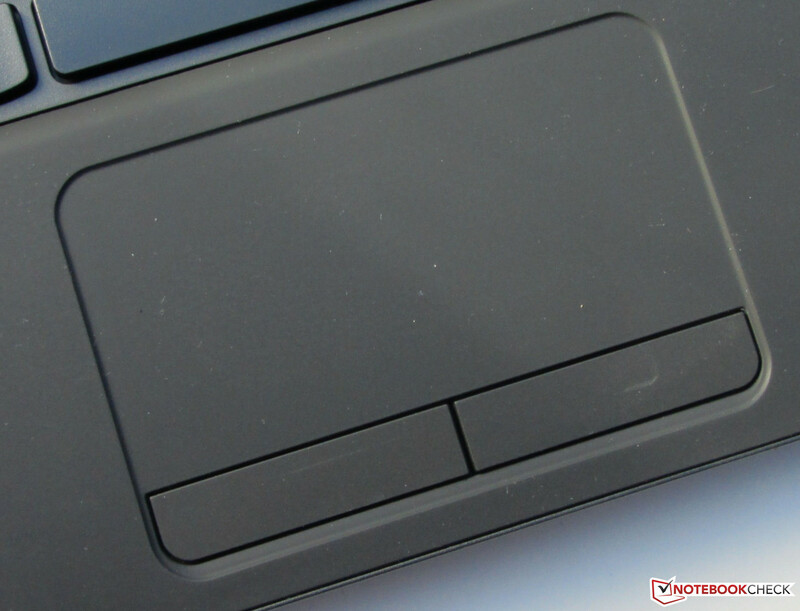 The Lenovo notebook uses the same case as the IdeaPad N581; it is made entirely of synthetic material. 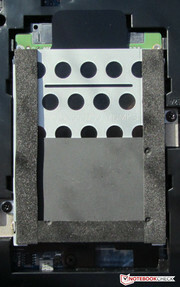 The back of the display cover and the surface of the base unit are covered with a rubber coating. The case left us with a sturdy impression. 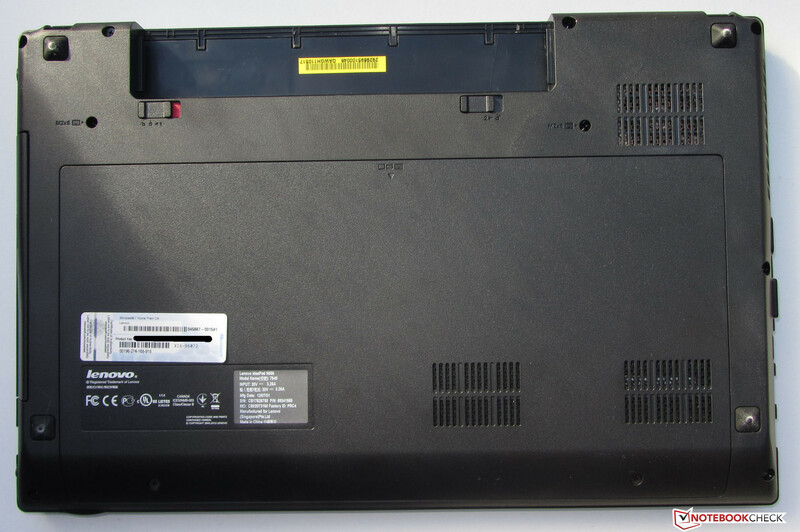 The case of the HP 655 and the Packard Bell EasyNote TK85-JN-105GE are also made of synthetic material. 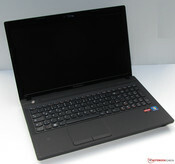 However, their quality, workmanship and sturdiness are not quite as good as that of the IdeaPad N586. 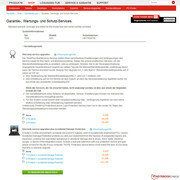 More information about the case can be found in the IdeaPad N581 review. Only the display border and the screen itself are glossy. The rubber coating protects the display from bumps. The maintenance flap is secured by two screws. Both Lenovo notebooks have the same ports and positioning. In contrast to the HP 655 and the Packard Bell EasyNote TK85-JN-105GE, the N581 and the N586 are both equipped with two USB 3.0 ports. Front: card reader (SD, MMC). The WLAN module of our test notebook is from Atheros (AR9285). It supports the 802.11 b/g/n standards and offers Bluetooth 4.0. A Gigabit Ethernet chip of the familiar Realtek RTL8168/8111 family ensures wired connectivity. A webcam is installed in the display cover. The accessories are not different from those of the IdeaPad N581: a quick-start poster and two manuals about the guarantee and security information. As such, it is not surprising that both Lenovo models have the same pre-installed programs. Like the IdeaPad N581, the N586 is delivered with a pre-installed copy of Windows 7 Home Premium OS (64-bit). System recovery is possible thanks to the Recovery partition. The delivery does not include any driver or OS DVD. The use of the recovery system is easy, even for novices: the system is started from the off state of the laptop by pressing the recovery button next to the power button. The user is then offered the choice of resetting the system to factory settings or to restore it to a later state. This second option is only possible if the user uses the pre-installed OneKey Recovery software to create a copy of the Windows 7 system. This procedure will create additional files on the laptop, which are deleted after the image is finished. The OneKey Recovery system has more functions than just system recovery. It includes a virus scanner, which can free the HDD from malevolent files. The pre-installed trial of McAfee Anti-Virus Plus did not work well on our test model. This could be due to a faulty installation on the laptop. The McAfee window could not be opened and, thus, no settings could be changed. The program prevented certain downloads (for example, Adobe Flash Player) in Internet Explorer. We could not even launch the uninstall setup. Thanks to the free McAfee Consumer Products Removal Tools, we could finally remove the software from our test model. 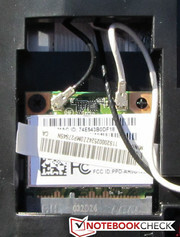 The maintenance flap hides the RAM, HDD and WLAN module. Sadly, it does not provide access to the fan. The HDD could be quickly swapped out with a screwdriver. 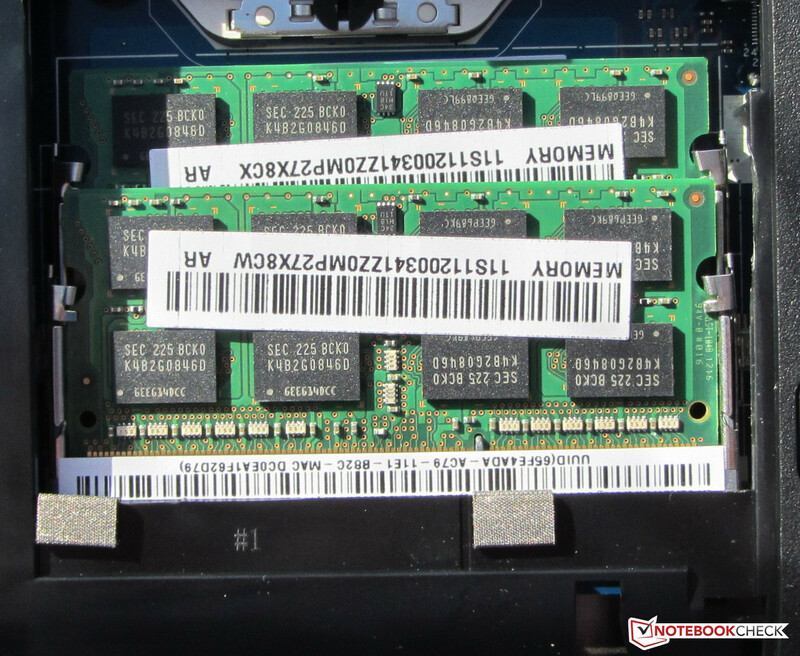 The two RAM slots of the IdeaPad N586 are each occupied by a 4 GB module. This means that the notebook is equipped with its maximum supportable amount of RAM: 8 GB. The three competitors IdeaPad N581, HP 655 and Packard Bell EasyNote TK85-JN-105GE are each equipped with a mere 4 GB of RAM. Sadly, this additional RAM provides no increase in performance in office use. Lenovo offers a 12-month bring-in guarantee for the N586. The buyer should send the notebook directly to the manufacturer in the case of a defect. 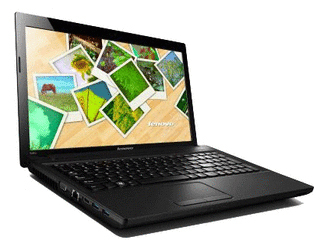 The Packard Bell EasyNote TK85-JN-105GE offers more and is delivered with a 24-month guarantee. The N586 warranty can be extended to 24 or 36 months. The respective guarantee extensions can be bought for 30 Euros (~$52) and 50 to 60 Euros (~$65 to $78). 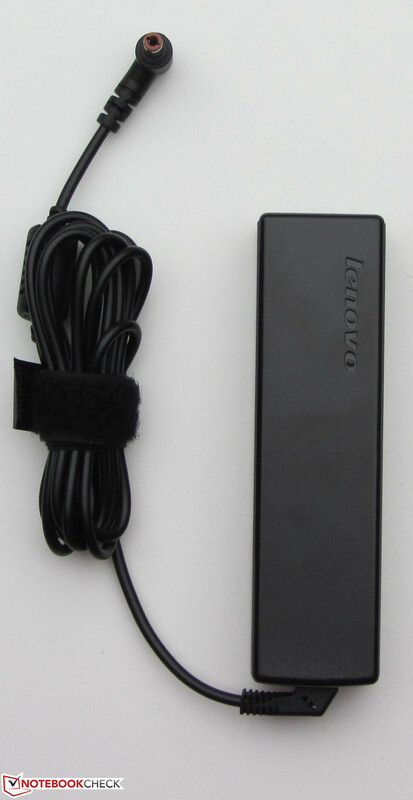 All available guarantee extensions can be found by entering the model serial number in the Lenovo Online Shop. 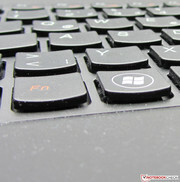 The keyboard is almost identical to that of the IdeaPad N581. The keys have a clear pressure point and a normal stroke distance. Unfortunately, the "Enter", "Backspace" and the right "Shift" keys are a little small. The 10.2 x 5.4 cm (4 x 2.1 inches) touchpad is made by Elan and offers enough room for all kinds of multi-touch gestures. The individual gestures can be de-activated in the settings menu. The entire hand-rest region, including the touchpad, is covered by a rubber coating. This coating acts like a brake if the finger is pushed too hard on the pad. The right border of the touchpad serves as a scroll bar. Both mouse keys have a clear pressure point and a short stroke distance. The Lenovo N586 uses the well-known Lenovo AccuType keyboard. 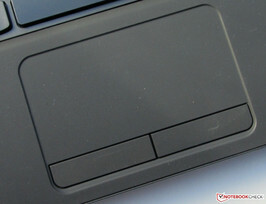 The touchpad has a rubber coating. Lenovo not only uses the same case for both IdeaPads, but also employs the same LG Phillips display. The glossy 15.6-inch screen operates with a resolution of 1366x768 pixels. The lighting is produced by LEDs. 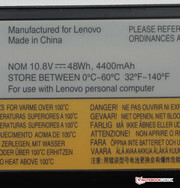 Lenovo does not offer other panels for the IdeaPad N581/IdeaPad N586 series. The average display brightness (228.9 cd/m²) is appropriate for the price-class of the laptop. 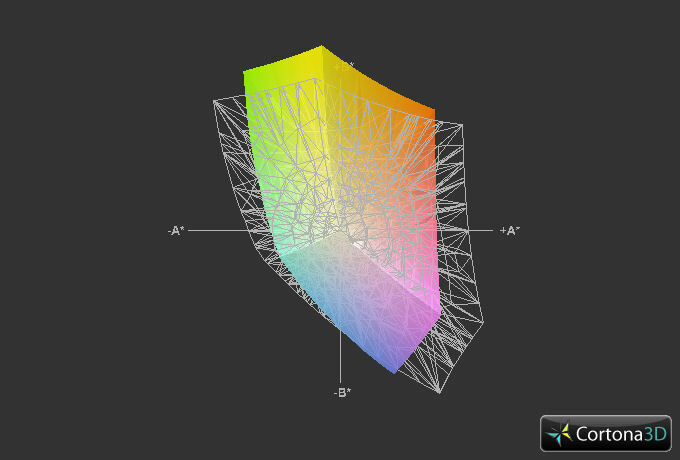 The HP 655 offers an average brightness of 161.7 cd/m² - far less than our test model. On the other hand, the Packard Bell EasyNote TK85-JN-105GE shines a little brighter than our Lenovo model: 242.1 cd/m². 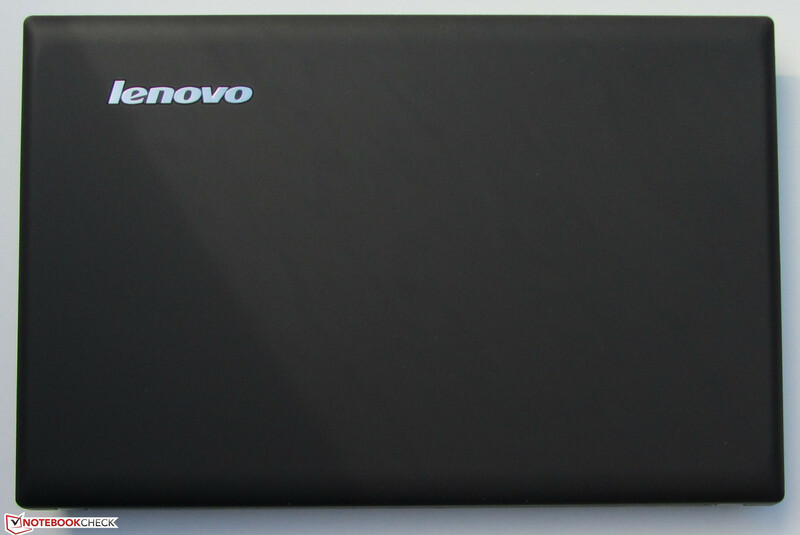 The black value of the IdeaPad N586 lies in the upper mid-field: 0.72 cd/m². The contrast is also quite good: 331:1. However, the N586 display cannot cover the sRGB and the AdobeRGB color spectrum. Attentive readers will notice that the contrast and black value of the IdeaPad N586 are much better than those of the IdeaPad N581, although both laptops use the same screen. This can be due to the fact that we used a different device to measure the values of the N586 display and that two identical displays from the same manufacturer can still have some slight differences. The brightness of the screen is enough for outdoor use. 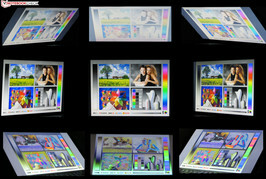 However, the user should avoid direct sunlight and bright surroundings, as the glossy display might then be plagued by a myriad of reflections. The viewing angles of both Lenovo 15-inch models are the same. A change in the vertical viewing angle quickly distorts the picture. A change in the horizontal viewing angle affects the picture less. 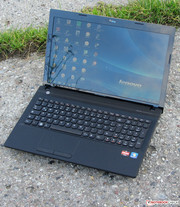 The IdeaPad N586 in outdoors use. The Lenovo notebook belongs to the class of office notebooks. Daily tasks, such as Internet surfing, VoIP, office work, video playback, etc. are taken care of with ease by our test model. The low noise emission makes the notebook a good choice for playing videos in the living room at home. The playback of HD videos is no problem for the AMD APU. We tested the playback in Full HD resolution (1920x1080 pixels) and H.264 coding. On average, the processor load lies at 10% (measured using DXVA Checker). The test video played fluidly, and Internet videos (on YouTube), which are in the mentioned formats, are also played fluidly. 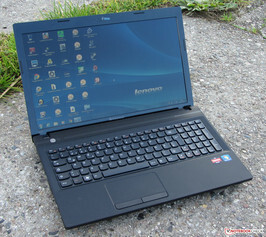 At the time of this test, we did not find any other IdeaPad N586 models. The N586 lies in the same price region as the IdeaPad 581 series: 479 Euros (~$620). Our test model runs on the AMD A6-4400M APU. This processor belongs to the AMD Trinity generation. The CPU part of the APU consists of a dual-core processor, which operates at 2.7 GHz. The speed can be raised with Turbo to 3.2 GHz. In our stress test (Prime 95 and FurMark run simultaneously), the APU runs at wildly fluctuating speeds. Our dual-core CPU runs at speeds between 900 MHz - 3.2 GHz, and the speeds of each core fluctuates independently. The GPU keeps hopping between 500 and 686 MHz. During the Cinebench benchmark, the CPU did not present a constant performance. In the single-thread test the processor operates at 3.2 GHz (both cores). Now and then one core slows down to 2.8 - 3 GHz. The multi-thread test was more contentious: 2.7 - 3.2 GHz, but most of the time, the CPU ran at 2.9 GHz. The results from Cinebench place our test model at the level of a similarly-equipped laptop, such as the HP Pavilion g7-2053sg. 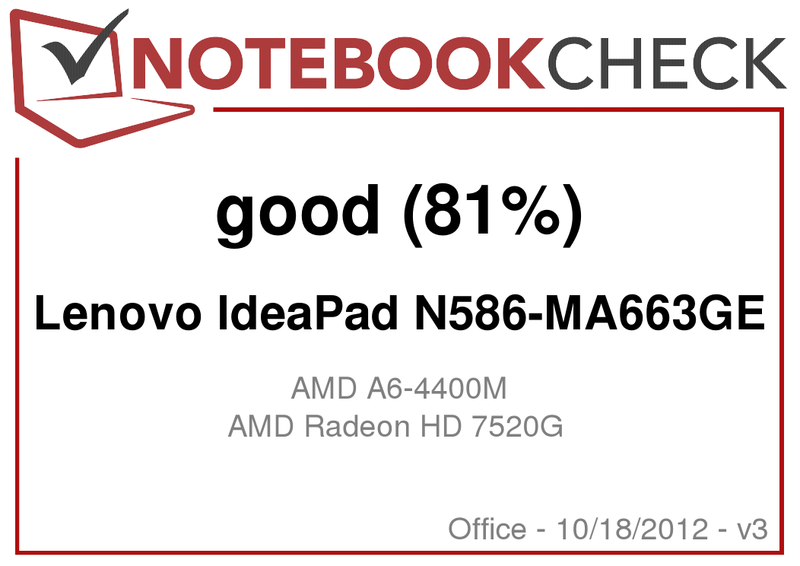 The IdeaPad N581 (Intel Pentium B970, Intel HD Graphics (Sandy Bridge)) produces better results in the CPU-based tests - the Lenovo N586 is the winner of the GL tests. Although, the Core i3 CPU of the Packard Bell EasyNote TK85-JN-105GE (Intel Core i3-380M, Nvidia GeForce 610M) is superior to the CPUs of the other three notebooks in the CPU test, its Nvidia GPU cannot keep up with the Radeon GPU of our test model. The HP 655 (AMD E2-1800, AMD Radeon HD 7340) places lower than the IdeaPad N586 in every test. The system performance of the Lenovo test model is good (subjective). In our opinion, it performs at the level of the N581. The results of the PCMark test for the IdeaPad N586, the IdeaPad N581 and the Packard Bell EasyNote TK85-JN-105GE are quite close together. In the PC Mark Vantage benchmark, the Packard Bell notebook can separate itself from the pack a little, thanks to its stronger processor. The HP 655 cannot keep up with any of the three laptops. Buyers of the IdeaPad N586 will not complain of too little storage space: the laptop is equipped with a 750 GB HDD. It offers more than enough space for music, pictures and other files. The other three notebooks are all equipped with 500 GB hard disks. The hard disk of the N586 is from the Western Digital Scorpio Blue series and operates at 5,400 rpm. The average transfer rates of the hard disks of all four notebooks lie between 60 and 70 MB/s and thus place in the lower section of our 5,400 rpm HDD table. The GPU of the AMD A6-4400M APU is named AMD Radeon HD 7520G. This entry-level GPU supports DirectX 11 and works at speeds between 335 MHz to 686 MHz. The IdeaPad N581 (Intel Pentium B970, Intel HD Graphics (Sandy Bridge)), the HP 655 (AMD E2-1800, AMD Radeon HD 7340) and the Packard Bell EasyNote TK85-JN-105GE (Intel Core i3-380M, Nvidia GeForce 610M) are beaten clearly by our test model in every 3DMark benchmark. In fact, the results are far better than those of the similarly-equipped HP Pavilion g7-2053sg. We believe this extra performance is thanks to the additional RAM and updated drivers. Users who want to run the latest 3D games at maximum details and the highest resolution will not be happy with the Lenovo IdeaPad N586. However, our test model might be a good fit for those users who want to run a game now and then and do not care much for the level of details. The IdeaPad N586 can run most games well at a low resolution and low details. At medium resolution and details the laptop can deliver acceptable fps (varies depending on the game). In general, our test model achieves better frames than the IdeaPad N581 (Intel HD Graphics). 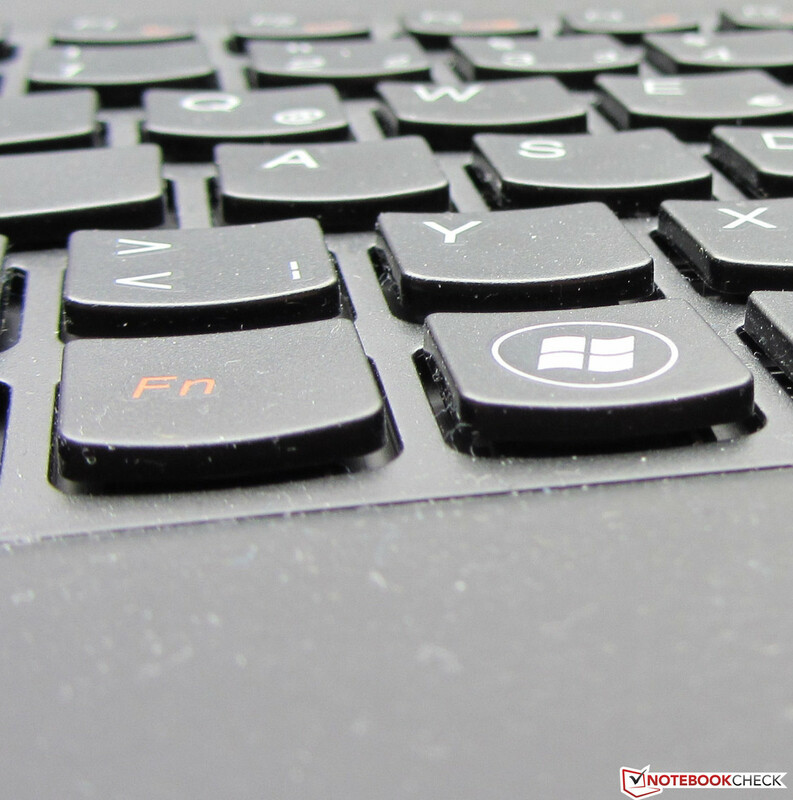 The IdeaPad N586 is as good as the N581 in this section. Our test model only gets slightly louder than the N581. While idle, our model has a noise emission of 31.5 to 32.2 dB(A). While the DVD drive is in use it emits 35.8 dB(A). At medium (3DMark 2006) and full load (Prime 95 and FurMark) the emissions rise to 34.7 dB(A) and 36.7 dB(A) respectively. The HP 655 and the Packard Bell EasyNote TK85-JN-105GE can hold their own against our test model while idle. However, at load, they emit higher emissions. The IdeaPad N586 in the stress test. While idle, the temperatures of the N586 (above and below) vary between 24 and 34.1 degrees Celsius (~75 °F and ~93 °F). At full load (Prime 95 and FurMark), the temperatures range between 23 and 40.6 degrees Celsius (~73 °F and ~105 °F). This high temperature emission was found at the touchpad. The bottom never gets this hot so it is always possible to use the notebook on the lap. 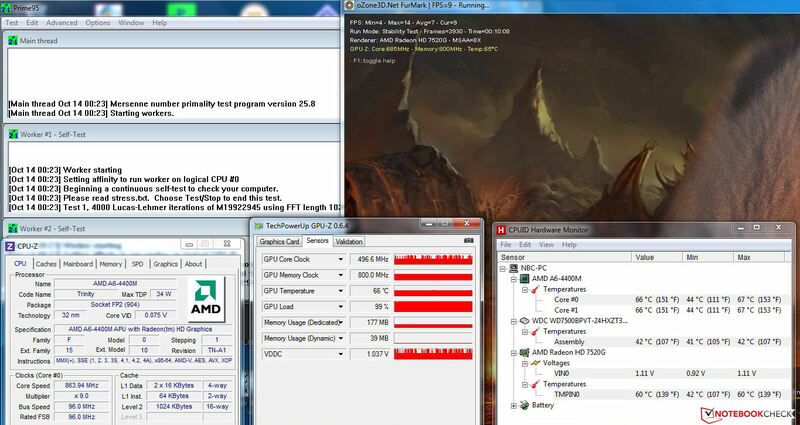 During our stress test (Prime 95 and FurMark run for at least one hour) with the power cable connected, the CPU (900 MHz to 3.2 GHz) and GPU (500 MHz to 686 MHz) speeds vary constantly. However, in the stress test on battery mode, the CPU (2.7 GHz) and GPU (335 MHZ) operate at constant speeds. The temperature of the CPU lies at 66 degrees Celsius (151 °F). (±) The average temperature for the upper side under maximal load is 33.3 °C / 92 F, compared to the average of 29.4 °C / 85 F for the devices in the class Office. (±) The maximum temperature on the upper side is 40.6 °C / 105 F, compared to the average of 33.9 °C / 93 F, ranging from 21.2 to 62.5 °C for the class Office. (+) In idle usage, the average temperature for the upper side is 28.3 °C / 83 F, compared to the device average of 29.4 °C / 85 F.
(-) The palmrests and touchpad can get very hot to the touch with a maximum of 40.6 °C / 105.1 F.
(-) The average temperature of the palmrest area of similar devices was 28.2 °C / 82.8 F (-12.4 °C / -22.3 F). The speakers emit reedy sound with weak bass. The pre-installed Dolby Home Theater software can provide better performance. Headphones or external speakers can improve sound quality. The IdeaPad N586 consumes more power than the IdeaPad N581. While idle, the power consumption ranges between 8.9 and 14 W. At medium (3D Mark 2006) and full load (Prime95 and FurMark run simultaneously), the consumption can reach up to 48.4 W and 60.1 W respectively. The words "up to" are important in this case, as the speeds of the CPU and GPU are constantly varying and this causes the power consumption to vary as well. 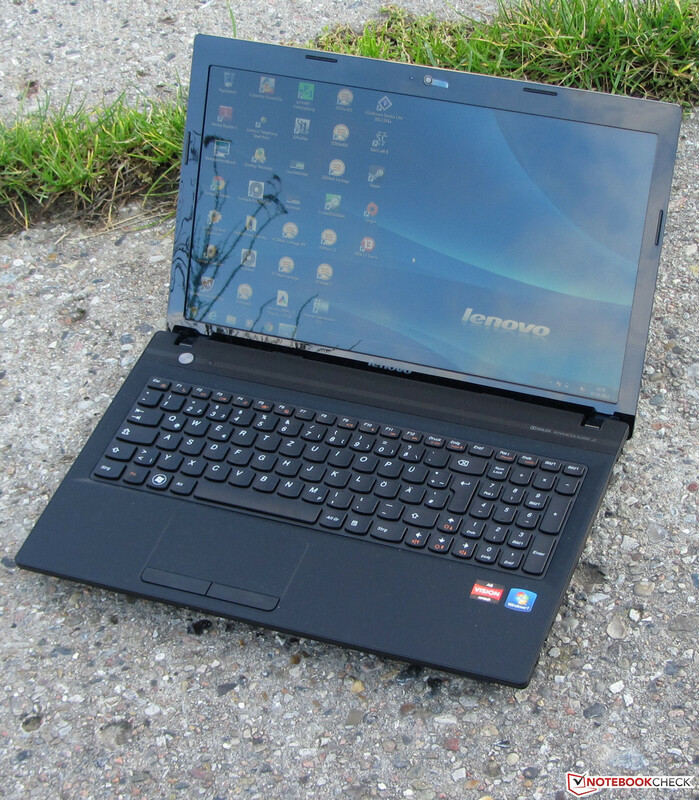 The Packard Bell EasyNote TK85-JN-105GE consumes about as much power as our Lenovo notebook. The power consumption of the HP 655 (at medium and full load) is far lower than that of the other three notebooks. This is thanks to the power-conservative AMD APU. While idle, the N586 has the longest run time: 7:10 h. The IdeaPad N581 (6:49 h), the HP 655 (6:32 h) and the Packard Bell EasyNote TK85-JN-105GE (6:12 h) are clearly lower. We checked the run times in idle mode using the Battery Eater Reader’s test. For this test, the screen is set to minimum brightness, the "Power Saver" mode is turned on and all wireless modules (WLAN, Bluetooth) are turned off. 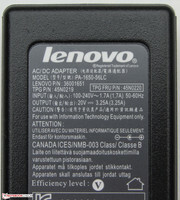 At load, the Lenovo model has a run time of 1:24 h. The N581 (1:20 h) and the EasyNote (1:24 h) lie at a similar level. The HP 655 delivers a far superior run time: 2:08 h. We run the Battery Eater Classic test to find the load run time of the notebook. For this test, the "High Performance" mode is turned on, brightness is set to max and all wireless modules are turned on. The IdeaPad N586 lasts 4:07 h in the WLAN test (N581: 4:20 h, EasyNote: 4:10 h). Once again, the HP 655 trumps the others with the longest run time (5:22 h). In the WLAN test, websites are loaded every 40 seconds, the "Power Saver" mode is turned on and the brightness is set to 150 cd/m². 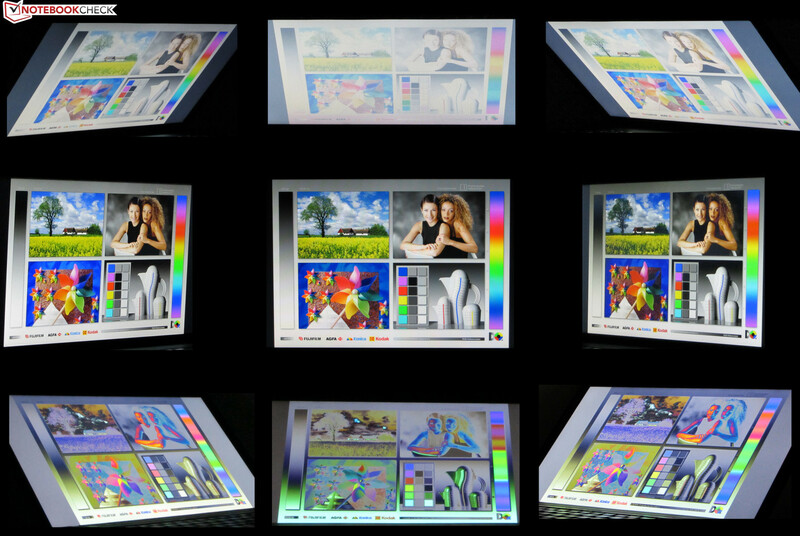 In the DVD test, our test model lasts a good 3:29 h (N581: 3:37 h, EasyNote: 3:22 h, HP 655: 3:41 h). During the test, the brightness is set to max, wireless modules are turned off and the "Power Saver" mode or higher (in case the DVD does not play fluidly) is turned on. 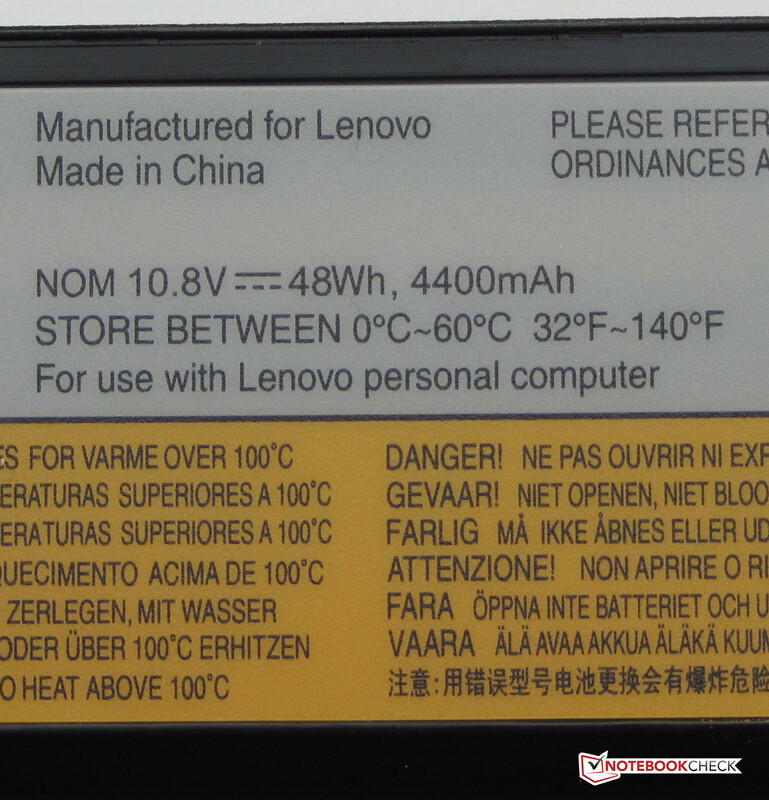 The run times of the four notebooks can be easily compared to one another, as all of them are equipped with batteries with almost identical capacities (Lenovo, Packard Bell: 48 Wh, HP: 47 Wh). The N586 model we tested in this review shines thanks to its 8 GB of RAM, a high-capacity HDD (750 GB) and low noise emissions. The program performance is sufficient and will satisfy most users. Thanks to the AMD hardware the user can even play a game now and then. Buyers, looking for an office notebook with enough performance for the occasional game, will be happy with the IdeaPad N586. Buyers looking for a cheap laptop for typing should save their money and take a look at the HP 655 (around 300 Euros/~$388) or the IdeaPad N581 model we tested. Both of these models will fulfill this role well. The Packard Bell EasyNote TK85-JN-105GE is a good choice for all users, who, in comparison to the other three notebooks, desire the highest possible CPU performance. If the buyer in more interested in the Lenovo N586/N581 series, but still wants the highest CPU performance possible, s/he should consider the IdeaPad N581-MBA4TGE, which can be configured with an Intel Core i5-3210M and lies at the same price level as our test model. The hinges hold the screen in position. 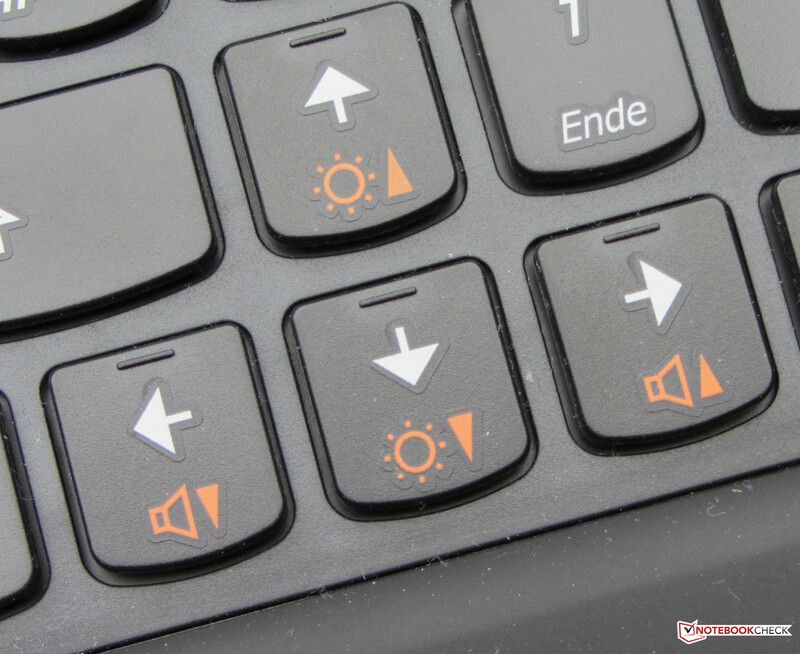 Good: thanks to the orange caption, the special function keys can be easily distinguished. 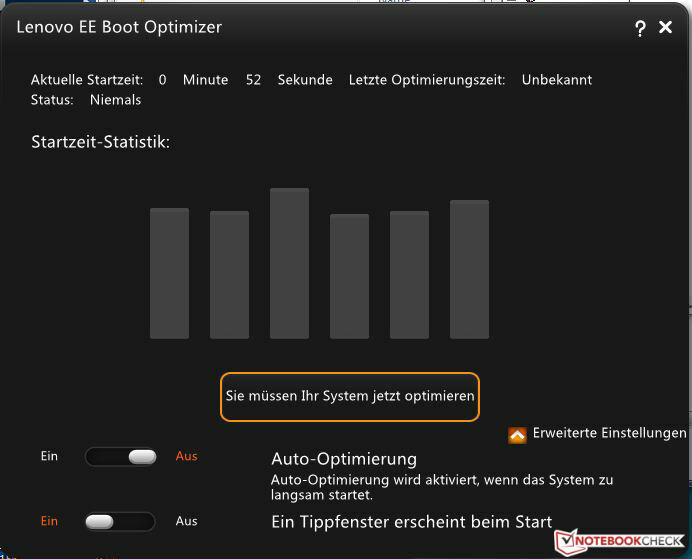 The pre-installed "Lenovo EE Boot Optimizer" tool should optimized/accelerate the Windows start. ...and delivers a maximum 65 W.
...and offers a capacity of 48 Wh. The DVD drive can also be removed. Two WLAN antennas are installed. The hard disk can be quickly swapped out. The IdeaPad N586 has two RAM slots. A big maintenance flap is installed. The keys have decent stroke distance. The small button next to the power button starts the OneKey Recovery System. The DVD burner reads and writes every type of DVD/CD. These are the extensions Lenovo offers for the IdeaPad N586. 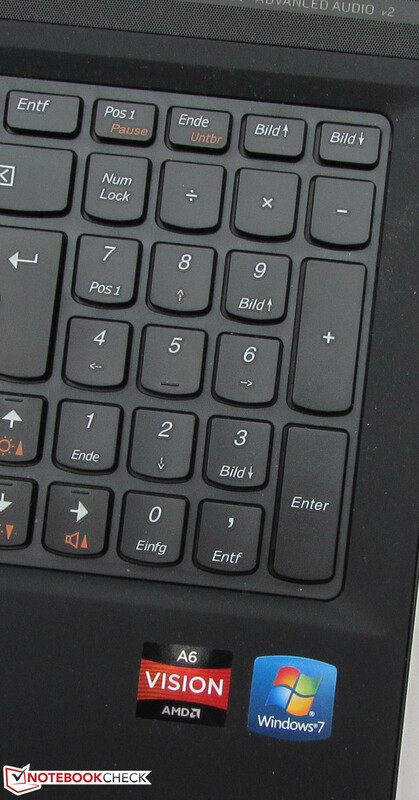 A numeric pad is provided. The low noise emissions and the rubber-covered display. A longer guarantee period and a display with better viewing angle stability. Lenovo has installed 8 GB of RAM and a high-capacity HDD in an entry-level notebook.